What is Wellness Stew Canned Dog Food? Wellness Stew Canned Dog Food is canned dog food that comes in two thick and chunky slow-cooked recipes that most dogs love. Using only wholesome ingredients and no meat by-products, wheat, artificial colors or flavors, Wellness Stew Canned Dog Food can be served either by itself, or mixed with your dog's dry food. Choose from Beef Stew or Chicken Stew and watch your dog as he or she gobbles up every last bit. Most dogs love the taste of Wellness Stew Canned Dog Food. Both recipes contain no wheat, meat by-products or artificial colors or flavors and are made with wholesome ingredients, you can feel good about feeding to your furry friend. 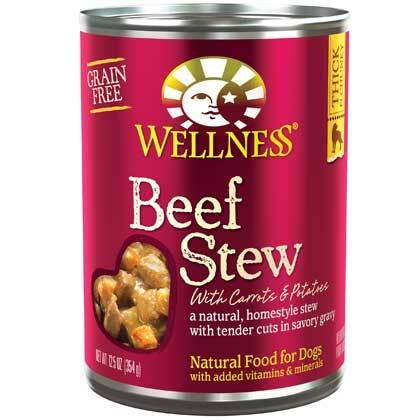 Available in Beef Stew or Chicken Stew, Wellness Stew Canned Dog Food can be served on its own, or as meal helper with dry food. Be sure to follow the feeding guidelines based on your dog's weight to ensure proper nutrition. When fed alone to adult dogs, feed 3/4 to 1 can per 8 lbs. of body weight per day, for puppies up to twice this amount. For combination feeding, reduce dry by 1/3 cup for every 1/2 can wet. Add up to 1/4 cup for each additional 2 lbs. of body weight. Ingredients: Beef, Beef Broth, Water Sufficient For Processing, Beef Liver, Carrots, Egg Whites, Peas, Potatoes, Potato Starch, Natural Flavor, Eggs, Guar Gum, Tricalcium Phosphate, Calcium Carbonate, Sodium Phosphate, Potassium Chloride, Minerals (Iron Proteinate, Zinc Proteinate, Cobalt Proteinate, Copper Proteinate, Manganese Proteinate, Sodium Selenite, Potassium Iodide), Vitamins (Vitamin E Supplement, Vitamin A Supplement, Thiamine Mononitrate, Vitamin B-12 Supplement, Vitamin D-3 Supplement, Biotin, Riboflavin Supplement), Choline Chloride, Rosemary, Sage, Thyme. CALORIE CONTENT:This food contains 1,022 kcal/kg or 362 kcal/can ME (metabolizable energy) on an as fed basis (calculated). Wellness® Beef Stew Dog Food is formulated to meet the nutritional levels established by the AAFCO Dog Food Nutrient Profiles for growth & maintenance. Ingredients: Chicken Stew Chicken, Chicken Broth, Water Sufficient for Processing, Chicken Liver, Egg Whites, Potatoes, Potato Starch, Peas, Carrots, Eggs, Guar Gum, Red Peppers, Celery, Natural Flavor, Sodium Phosphate, Potassium Chloride, Minerals (Iron Proteinate, Zinc Proteinate, Cobalt Proteinate, Copper Proteinate, Manganese Proteinate, Sodium Selenite, Potassium Iodide), Vitamins (Vitamin E Supplement, Vitamin A Supplement, Thiamine Mononitrate, Vitamin B-12 Supplement, Vitamin D-3 Supplement, Biotin, Riboflavin Supplement), Choline Chloride, Rosemary, Sage, Thyme. CALORIE CONTENT:This food contains 905 kcal/kg or 320 kcal/can ME (metabolizable energy) on an as fed basis (calculated).